Started this site way, way back in November 1998, when the web was young. It's still here, and so am I. 2018 has been a year of not much wargaming. I’m busy and well, just not doing a lot of gaming. Last month was a bit of a milestone, though, that I should acknowledge: November 2018 makes twenty years straight of me having a wargaming presence online of some sort or another! Way back in November 1998 I signed up for a Geocities account (remember them?) and built the first version of this site in my college’s computer labs, because I didn’t own my own PC until 2000 or so. While I’m at it: Merry Christmas, Happy Holidays, Happy New Year, and such. May the holidays season be what you need from it. It was an excellent weekend. 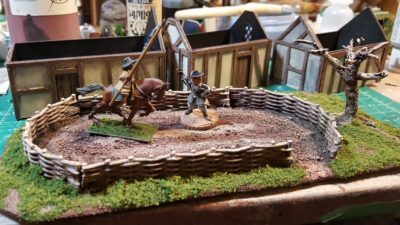 I was under-prepared for my Pulp Alley games but managed to get enough done to pull them off. The table, at least, looked awesome as I’d been distracted from other prep by the building of many new buildings. Eight players each running a full ten point League is really too many bodies around the table and too many figures on the table, but it was glorious chaotic fun. The geese won. Lots of other good games, and of course the meetings with all the folks I usually only see once a year at each successive Trumpeter Salute. I actually have some great photos; I’ll get them off my phone over the next couple of days and posted here, along with a more coherent narrative! 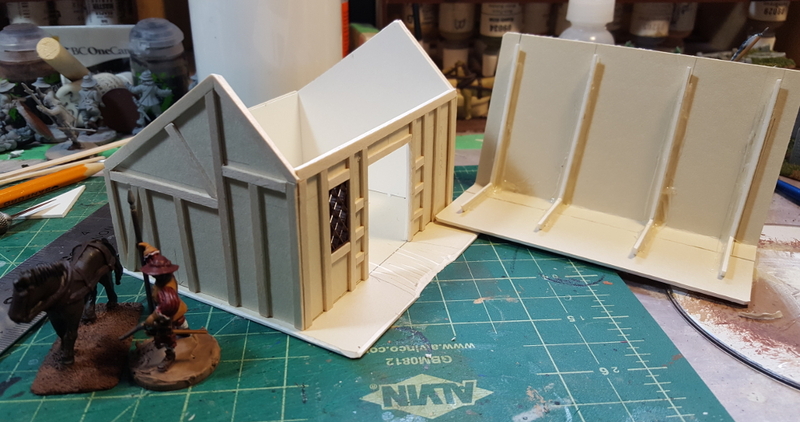 After finishing the three little cottages on Saturday, I decided to do something slightly different on Sunday and made a building that could serve as a stable or other outbuilding for a manor farm on my ECW/English pulp tables. It’s 3″ deep and 4″ wide, so actually larger in footprint than the little hovels. Horse need their space, tenant farmers not so much! Same construction, 1/16th mattboard (picture framing card) with wooden coffee stir sticks for the timbering. The roof is assymetric, with the peak closer to the front of the building instead of down the centreline, for no other reason than it looked more interesting and on a gaming table, people spend a lot of time looking down at rooftops! 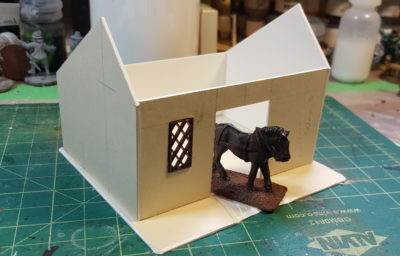 Stable “blank” assembled, with window and horse both from Warbases. Click for larger. 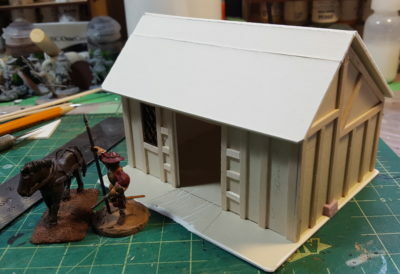 A roof with a pitch like this should probably be shakes or slate or something, because a steep pitch is part of what helps keep a thatch roof watertight, but towel thatch is a heck of a lot faster to assemble than a shingled roof, even with Warbases’ nifty lasercut tile cards available! Perhaps I’ll go back and rebuild this roof with tile card in the future, when I’m not under a pre-convention time crunch… but don’t hold your breath! All the half-timbering complete and unthatched roof in place. Click for larger. Roof off, showing the card “beams” to give it some strength. Click for larger. Towel thatch in place, including an extra strip across the top ridge. Paint to follow! Click for larger. With the clock running on toward Trumpeter Salute 2018, I need to get serious about producing the new scenery the linked pair of games I’m running there need! I’ve got more than enough hedges, dirt roads, and other greenery bits from previous scenery projects, but the farmhouse/manor, dovecote, and barn I’ve built previously need more buildings to hit the table along with them if I want to do a 17th Century English hamlet up properly. This weekend I sat down and cranked out a trio of little (tiny, really!) thatched and half-timbered cottages or hovels, along with a pair of fenced gardens. Three cottages underway. 28mm Warlord officer on a 25mm base for scale. Click for larger. 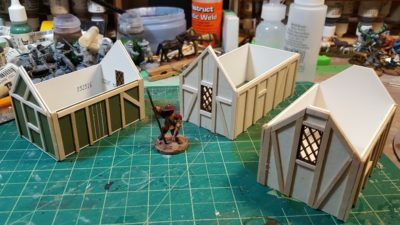 These are simple little buildings of 1/16th” mattboard with half-timbering from wooden coffee stirrers and thatch from towel. The windows are lasercut from Warbases in the UK. For a bit more bulk the roofs have a substructure of corrugated cardboard with the towel hot-glued to that and then further stiffened with white glue. All three roofs are removable. 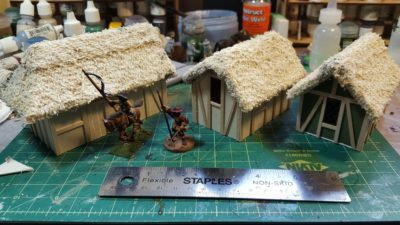 Towel thatch roofs in place. Click for larger. 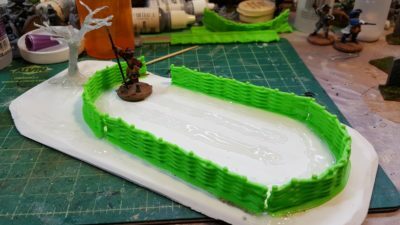 For the gardens I started with 1/8th” foamed PVC board as a base, then used some of the 3-d printed wattle fencing from Thingiverse that Corey has run off from me the new 3d printer he’s also using for the tricycle truck project. Large fenced garden with a tree. 28mm Warlord officer on 25mm base for scale. Click for larger. The tree has a core of paperclip wire, bulked out with soft iron craft wire, then covered in hot glue to fill in between the wires. The garden beds are also just hot glue “sculpted” into place with the hot tip of the glue gun. Painted cottages and painted and flocked garden. Click for larger. I’ve also done a second garden piece, slightly smaller, but haven’t gotten a photo of it yet. 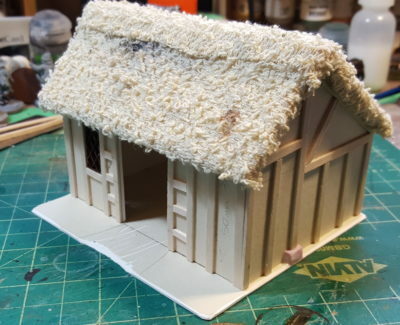 The cottage roofs need one more drybrush to really pop the thatch texture, but the cottages themselves are all done, and the gardens are fully painted and flocked outside the fence. The tree needs some foliage, and the gardens inside the fences need greenery and detail, but not bad for part of a weekend’s focused effort! Horses in colours other than brown! Armour in colours other than silver! Dogs and cats living together! Chaos and disorder! Well, something like that. Horses and armour, at least. I realized that all twelve horses for my regular ECW cavalry are all brown. Every last one of them. There’s a bunch of variation in tone, mane colour, stuff like that, but they’re all bay, which is horse-speak for brown. Well, some of them might be chestnut, which is horse-speak for “lighter reddish brown”, more or less. 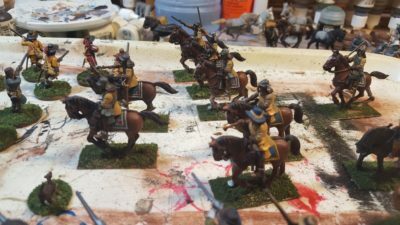 For the six horses I needed for the current batch of cuirassier I decided to mix it up a lot. There’s a white horse, two different shades of grey, two different bay, and one black horse. All six cuirassier horse. Hair, mane, and tail all done. Hooves, tack, and some details still to do. Click for larger. Unfortunately I totally forgot to write down any of the paint mixes or layers I used for this batch of painting, so I’ll have to re-invent the wheel, or at least the horse paint, next time I do horses! For the armour, I put pins up into the backsides of all six cuirassier, making them extra-long to make painting easier. Then I used a scrap CD, two lengths of scrap wood, and my hot glue gun to create a very useful little painting stand, seen in the photo below. 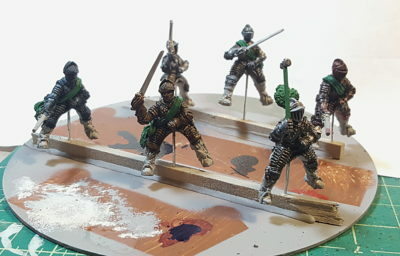 All six riders got all their armour basecoated bright silver (Reaper’s True Silver), then various inks and washes were layered over to try for a treated-metal appearance as discussed in my last post on coloured armour. GW’s washes don’t work as a base layer for this, I discovered right away. They’re not designed to stay on flat surfaces particularly well, although they shade crevices and lower areas of a surface very nicely. I used India ink for the three blacked armour sets, Reaper’s Red Ink for the russeted armour, and FW Artist’s Acrylic Inks for most of the rest of the colour. The three blacked armour riders were basically done after one coat of thinned India ink, and then I went back in with metallic paint to do some of the edges and highlights, especially on the rider in the foreground of the photo with the hammer and plume. Armoured riders. Front right blacked with silver edging, rightmost russet, two background guys both blacked, blued armour on the far left, then the second russet armour guy foreground centre. Click for larger. I’ve also discovered that these guys are nearly impossible to get a decent photo of in their current setup, the above blown out and fairly crap photo is less crap than all the rest. I’ll try for better pictures once the riders and horses are all attached to each other. Still to do is boots, saddles, faces, and weapons. I’m really pleased with how these guys are turning out so far, and I think they’ll look great on the tabletop once they’re all finished. Ink over silver is definitely a win for doing coloured armour! Colourful Cavalry: Armour as well as horses! But what about the riders? Unarmoured or mostly unarmoured riders provide obvious opportunity for colour, depending on the army or era you’re modelling, but if it’s knights or early 17th Century cuirassier in full plate it’s all going to be silver/grey metal armour, right? Armour can, in fact, be lots of colours than just “shiny metal”. It probably should be, in fact. Blacking, russeting, or even painting seems to have been fairly common. Keeping armour “white” (shiny) was a lot of work on an ongoing basis so a lot of munition-grade ordinary armour was finished in some way. A lot of the armour in museums that’s shiny these days probably shouldn’t be. As the Wallace Collection says on their website about one partial suit of 17th C armour, “Like the others of its group, this one originally had a ‘black-from-the-hammer’ finish, but was polished bright comparatively recently, almost certainly in the 19th century.” Another thing we can blame the Victorian era for! Russeting, blacking, and other forms of surface finish are done with various oils, acids, and other chemicals along with heat to seal the surface of the metal and protect it from rust and other corrosion. An interesting and informative thread over on My Armory (an arms/armour collector and creator forum) talks about various historic and modern treatments and the various shades that can be achieved. One essay on russeting I found uses modern Clorox bleach and baby oil! ). The favored color for armor, edged weapons, and firearm barrels was a deep blue, in a process is referred to as “bluing.” A range of colors could also be produced chemically, using a variety of different recipes, such as a rich brown color that was popular on firearm barrels in the late eighteenth and nineteenth century. Besides being attractive, patination and painting also inhibit rust on metal surfaces. This gorget is contemporary with the English Civil War (c. 1640) and is blued with gilt edging. Image off the Wallace Collection website. Click image to see the listing there. The entire Wallace Collection website is well worth looking through, by the way. It includes a huge collection of arms and armour through the ages, and a really well organized Advanced Search function to make things (slightly!) easier to find. For a straight-up painted helmet, this one is 15th C, much earlier than the period I’m currently concerned with, but had red and white (now discoloured almost to yellow) paint that is still colourful and must have been spectacular when it was new. I don’t think, from what I’ve seen, that full on painted armour was still current by the mid-17th C, but blacked, blued, russeted, and even gilded surface treatments were certainly in regular use. When it comes to miniature painting and armour, I’m thinking that the best way to represent coloured armour would be a metallic base coat and then inks or washes over that. I’m going to do some experimenting on the six cuirassier current on my painting bench and will report back! Incidentally, if someone managed to save a copy of the Games Workshop article from back in 2011 I once linked to here I’d love to have it. I recall it opened with joking about how the author just painted all horses brown until his daughter told him his horses were boring, or similar! Not the greatest photographs going, but so far the only ones I’ve gotten of all of my recently completed 28mm ECW figures all together! Every figure finished recently! See text for details, and click for larger. Starting top left, the dark yellow coats belong to six firelock musketeers (in Pikeman’s Lament terms, either a Forlorn Hope or Commanded Shot). Clockwise we have two troops of regular horse, six per troop. One unit is brand-new and the other had most of it’s painting done years ago but have been touched up and re-based just recently. Somewhere in amongst the other horsemen is the mounted commander as well, finally finished and based. The bottom centre infantry unit is a dozen muskets in green, then a dozen pike in green, and finally a dozen muskets in blue. There’s a couple of extra officer/sergeant figures in there as well. 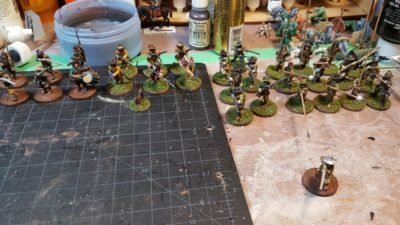 The only unit not on the tray in the photo above is the twelve pike in blue I finished back in July 2017. All these figures are from Warlord Games. The new horse, with blue and white horse blankets, as well as some of the older horse with blue and yellow on the horses. Click for larger. Finally, for fun and extra colour, I’ve been painting up the farm animals I got from Warbases early in 2017. Geese and sheep, all from Warbases. See text for details, click for larger. The geese are on a 40mm round styrene base, while the two sets of sheep are on roughly rectangular bases about 1″x2″. They’ll mostly be just scenery, or objectives in games that need loot tokens, but I’m also planning on using the flock of geese as a hazard in games of Pulp Alley, because big geese can be scary psycho critters! Still in progress on the farm animal side are five or six ducks to go in and around the ponds I made in 2017, two big cart horses, and a couple of goats. I’ll probably get a few more animals on my next Warbases order, they’re fun to paint and provide great extra detail and colour on the tabletop. On the ECW figure side of things the first six cuirassier heavy horse are in progress, and I’ll be doing up at least one more unit of firelock muskets. There’s also six officer/sergeant/character figures in progress – more on them in another post! Slightly belated Happy New Year to all! 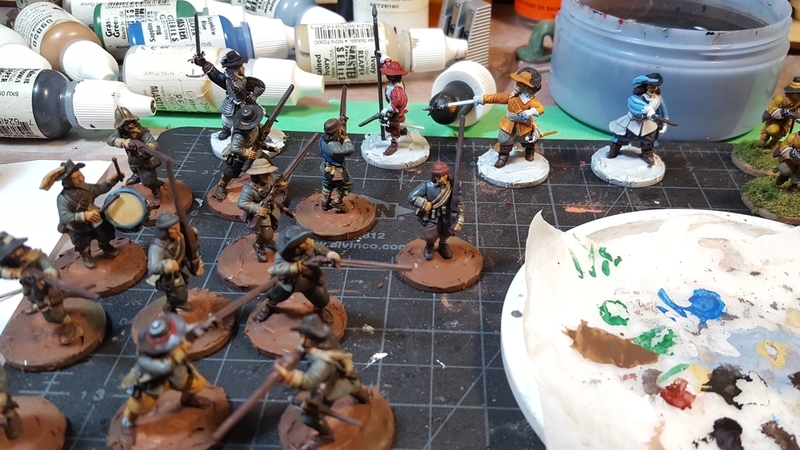 After months of doing absolutely zilch on the gaming front I saw the year out in some style, at least, with a whole bunch of English Civil War 28mm figures pushed through from “almost done” to actually finished in my time off between Christmas and New Years. Two units of musket, one of pike, one of firelocks, all DONE! Click for larger, see text for details. This means that all of the regular soldier figures seen on the workbench back in June are now finished and ready to game with, just the four officer/character figures seen there still to finish off. The cavalry on the table now include five figures that I “finished” for the Lead Painter’s League way, way back in early 2011 (!) that have sat around ever since. I had thought these ECW figures had sat around for four or five years, but apparently it’s been more like seven. Yikes. “Finished” is in scare quotes in here because I was never happy with some of the details and finish on the riders, having put most of the effort in the horses. 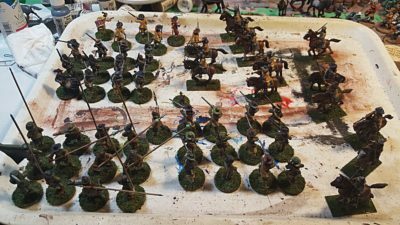 They’re back on the painting table for touchups, as are the other seven cavalry figures from that box of 12, and the first six heavy Cuirassiers for extra cavalry punch. Cavalry of various flavours in various stages of completion, and the four officer figures. Click for larger. 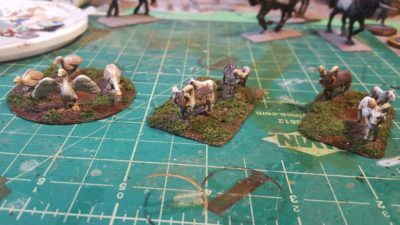 Finally, I pulled out a bunch of farm animals from my Warbases order of early 2017 and cleaned up and based six sheep, two cart horses, and a flock of geese, just for fun and extra flavour in games. They can act as loot markers in Pikeman’s Lament, just as scenery, or (especially the geese, geese are evil!) as unique hazards in Pulp Alley games! Cavalry, sheep, geese, and some barrels. The unpainted horse on the far left are for the cuirassiers. Click for larger. Looking forward to a bit more gaming in 2018 than 2017 had to offer, including more Infinity and some games at Trumpeter Salute 2018 in a few months! I’m fairly sure the last time I touched a paintbrush was back in July. Maybe August. As posts here will show, all wargaming activity of any sort coasted to a stop sometime in the first week or so of September, mostly due to a brain- and free-time-destroying family health crisis and associated astronomical levels of stress. Most of that is sorted and past now, thankfully, and I did some fun non-wargaming creative stuff before Christmas so I’m finally sitting back down at the painting desk and getting stuff moving again. I’ve committed to running at least two games at Trumpeter Salute 2018, as I mentioned last post, so I need a bunch of my ongoing English Civil War figures and scenery done by March. To that end, I’ve started cranking through the long-neglected ECW figures, most of the plastic Warlord figures. I finished the last details and added flocking to a unit of six firelock musketeers, half a unit of regular musketeers, a full unit of a dozen pike, and a dog. I’ve since moved on to another dozen mostly-finished musketeers and four more officer/character figures. The officer/character types are a chance to bust out some fun colours, as officers rarely wore uniforms in this period and often dressed like the gaudy wealthy gentlemen they were. Finished figures – six firelock musketeers in mustard yellow, six regular musketeers in blue, and a full dozen pike in blue. And a dog. Click for larger. Four colourful officers in the background and part of a unit of a dozen muskets in blue in the foreground. Click for larger. I have this week between Christmas and New Years off, so before the end of 2017 I might actually get a usable 24 point Pikeman’s Lament force finished by forcing myself to deal with a lot of the mostly-painted figures! Still Around, Happy Holidays, & Such! Real Life ganged up on me pretty solidly around mid-September and didn’t really let up until nearly the end of October, and by then other hobby interests had wandered in and distracted me from wargaming, hence the utter lack of updates here in three months! I’ve committed to running at least two games at Trumpeter Salute 2018 in mid-March, though, so I need to get going on finishing scenery and figures for that! In the mean time, Happy Holidays, Merry Christmas, and Happy New Year to all my readers, just in case I don’t get around to another post here before 2017 staggers to an end.